Our nation is on a collision course with financial calamity. America’s national debt is at historic high levels, and we are running deficits that cannot be maintained without eventually bankrupting our nation. The question at hand is how we can survive the economic hardship that would result from a default scenario. We believe Jesus was talking about the Rapture climate in Luke 17:26-29.He used the "days of Noah and days of Lot" to prophesy the time of His coming again. He listed conditions at the time of that coming. People will be building, marrying, and planting--it will be business pretty much as usual for the times. Those times will, of course, be wicked--much like the mockers and violence of Noah's day leading up to the Flood and the homosexuality and violence leading up to Sodom's destruction. This could not have been Jesus talking about the end of the Tribulation period. At the end of that will be the most horrendous time in history, according to Jesus (Matthew 24:21-22). At that time, as many as two-thirds of the world's population will have died in God's wrath and judgment. Yet the people in this Luke account are building, marrying, etc., when He suddenly returns and destruction begins. If there were such great economic cataclysm as to completely throw the world into great chaos--as would occur with the U.S. and all of the world's economies collapsing--there would not be a time such as described by Jesus in His prophecy. People would not be building, marrying, planting, and harvesting. They would be starving, and things would not be going along pretty much as normal, which are described as conditions in Jesus' Luke 17: 26-29 prophecy. The Rapture could be the pin that pops the economic bubble. The great destruction will then begin. God's wrath and judgment will follow as Antichrist and his global reorganization of things come onto the scene. Nothing is preventing us from going through a deep recession. The Tribulation hour does seem to be very near, but since a train of economic despair is rapidly heading our way, we can't ignore reality. We may find ourselves having to endure a brief period of profound financial adjustment. The first sign of problems is not the government defaulting on its massive debt. We owe trillions of dollars to the rest of the world, but the Chinese aren’t going to come and foreclose on the Statue of Liberty. Uncle Sam has the power of the printing press to service its debt. The U.S. Treasury can print all the money it needs to continue to fund our government’s operations. The first thing you need to do to prepare for hard times is change your priorities. In an economic downturn, our concern needs to switch from luxuries to core needs like food and shelter. We have become extremely spoiled by a host of modern conveniences. In an economic downturn, some of these things will have to be given up. Yes, it is possible to go on living without your cell phone. In 2008, I read the sad story of a wealthy man who had everything and threw it all away. Adolf Merckle, the owner of a holding company in Europe, committed suicide when his firm lost billions of dollars in bad transactions. This guy went from being worth over $10 billion to just $1.6 billion. Of course, most people would have been thrilled to switch places with him. Merckle took his life because he couldn't cope with the need to downsize his lifestyle. Debt is a very seductive concept. Though the magic of credit, you can have everything you want right now. The price of instant gratification is that you become a slave to creditors and you put your financial health at risk. Debt is the first step on the slippery slope to monetary annihilation. When economic hardship comes, people who are heavily into debt are always the first to go. If you can pay off any debt that you may have, that will do a lot towards improving your financial situation. By reducing the amount of minimum payments you have to make each month, you will be better prepared to handle a job loss or a financial emergency. If we should go into a period of hyper-inflation, it is very important to preserve the value of your money. Inflation is a very simple economic process, but few people understand how it robs them of their money. Gold and silver are good tools to hold the buying power of money. 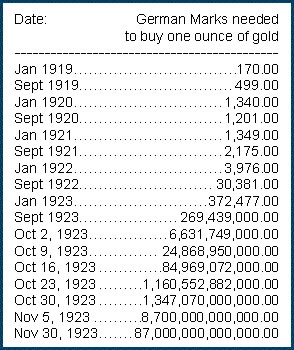 Because the government cannot produce gold or silver, it’s not going to decline in value. I prefer silver because you can sell silver coins as you need the cash. You have to be very careful about where you buy silver coins. Many precious metal dealers charge huge mark-ups or offer products that have no real value. Never buy anything from a TV ad or purchase items labeled "replica," "clad," or "proof." Most major cities have coin dealers. You want to always buy from a business that sells high volumes of coins. You should never purchase them from a pawn shop or flea market. A good online company is Apmex.com. They have some of the best prices on gold and silver. During times of financial misfortune, the supply chain for food may become strained. As we switch from a steak-and-lobster economy to a beans-and-rice economy, filling one's belly will be a daily top priority. Because most provisions have a limited shelf life, it's good to be able to produce your own food. This may seem odd, but raising chickens is an excellent source of nourishment. Because most people don't live on farms, or they have limited space to grow food, a small-scale poultry operation is a great way to feed your own family and provide local food to others. Chickens provide eggs every day, offering a concentrated amount of nutrition and essential fats. When the time comes, you can order hatchlings by mail and raise them on corn meal and the bugs that live in your yard. Some people might initially be uneasy about the idea of eating chickens they raised by hand. Trust me, if you get hungry enough, more standard pets like Snowball and Lassie might well seem appealing. I don't recommend going hog wild by building a fortified compound in the backwoods. Nothing in the Bible says we should become recluses. Our hope is not in how much precious metal we have stashed away, in how well we can shoot a gun, or in our ability to process a deer carcass. Our trust should be in Jesus Christ, the One who has promised to deliver us from this doomed world.